NOTE: That we have extended the time and will be meeting at 2PM until 4:45, May 13. If anyone has to leave early for Mother’s Day plans, hopefully that will not prevent you from attending the first part of the Workshop. Lea and I will both be there, reviewing stuff we have done and showing how it relates to as much World Fiddle Day stuff as possible. We are also looking forward to a lovely World Fiddle Day Concert, Friday night, May 18 at Hugh’s Room. Please consider reserving a table OR individual tickets for Africa-Cuba-Canada: A Global Fiddle Celebration, the result of and exciting partnership with Batuki Music especially for this year’s event, all supported by Polyphonic Ground (a new Collective of World Music Presenters in Toronto that World Fiddle Day Toronto is part of). NONE of that money actually goes to us, it’s just the cost of great artists and a great venue ($30 Advance, $35 at the door, link on our HOME page). THEN, there’s the great day, of course. – Workshops with Shane Cook and Elizabeth Rodriguez. You don’t even have to choose, you get to come to them both. – A short lunch (bring your own or grab something from one of 4 or 5 places in the neighbourhood). We are asking as many people as possible to register in Advance, even if you are under 30 (free) or just coming to listen (free). Space at Hugh’s is limited and reserving an audience spot guarantees we will save room for you. Register HERE. Cost is $25 (with a Friday night ticket) or $40 for the day. This pays our Workshop leaders, House Band and Hugh’s Room. We and Hugh’s are both non-profit enterprises. 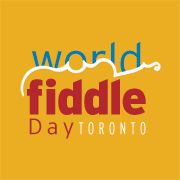 IF for some reason you can’t join us, we hope you will pick up your fiddle wherever you are and play a tune in honour of the fellowship of music on World Fiddle Day.